Every area of the country has their regional grocery stores. 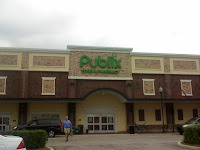 Living here in South Florida, my closest regional grocer is Publix. It's been my store of choice since moving down mostly because of the great selection of FRESH foods. I can always pick up the freshest fish and sushi, the butchers have NO PROBLEM with any special requests I might have, you won't find a BETTER BAKERY anywhere and the produce department has helped me out on SO MANY occasions by making fresh fruit salads for me to serve when we have brunches here at the mansion. I especially love when they have THEMED sales and BOGO (buy one/get one) sales. Right now you'll find Publix Italian Days going on at your neighborhood Publix supermarket. This means the BEST prices on pasta and sauce, peppers and onions as well as LOTS of General Mills products like Progresso, Green Giant, Pillsbury, Betty Crocker, Muir Glen, and Totino’s. Between now and March 3rd, you'll be able to find some GREAT deals and it's definitely time to stock up on your favorites. I bought some chicken and Progresso Bread Crumbs (for Chicken Parmesan), Muir Glen tomatoes (for making sauce or gravy as my mom used to call it) and some Rigatoni to create my own Italian Feast while I went shopping there this week. You can also enter the Publix Italian Days Sweepstakes, sponsored by General Mills, for a chance to win one of four grand prizes of $10,000 worth of free groceries or one of the 200 $100 Publix gift cards being given as prizes. There are three easy ways to enter for a chance to win the Sweepstakes. Enter via phone, mail or at ClickCallMail.com – a convenient one-stop website. Not only can you participate in the Sweepstakes at ClickCallMail.com, you’ll also be able to download great coupon savings on some of your favorite General Mills brands and other great offers at Publix. 1. Click – Stay up to date with the latest General Mills promotions happening at Publix, by visiting ClickCallMail.com (right now they have this and two other promotions/contests going on). Once you’re registered and logged in, you can participate in any the current promotions. 2. Call – If you’d prefer to enter the sweepstakes and participate in other promotions via telephone, feel free to call the General Mills/Publix hotline, at (800) 627-6059, and be sure to say that you want to enter the Publix Italian Days Sweepstakes. Make sure to provide your complete contact information, such as name, address and phone number so that they can contact you if you win. 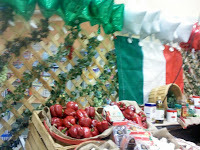 Just think of it, winning $10,000 in the Publix Italian Days Sweepstakes could BUY YOU A TRIP TO ITALY! Publix is also offering one of Champagne Living's readers a $25 gift certificate (like I got) so that they can shop for an Italian Feast as well (details below). A gift card, giveaway and information have been provided by General Mills through MyBlogSpark for this review. All opinions are strictly my own. Join the Champagne Living Community - NEW! Blog about this giveaway on YOUR blog! Be sure to leave a comment letting me know if you've done any of these (if you already subscribe or have our badge - please note that in the comments as well). * This giveaway is open to US residents, 18 and over and ends on March 12, 2010 11:59 EST. I follow you on Twitter as mgoss123. I also follow I Pity the Blog. my italian dish is lasagna! i hit enter before i put it in!!! No - David Bowie is NOT coming to Champagne Living (although I've been called Ziggy instead of Zippy on many an occasion). Champagne Living will be going through some changes in the near future. While I'm hoping that it will be fairly seamless for YOU the reader, please don't get alarmed if we're not dressed in the manner that you're used to. We'll be debuting a NEW look for 2011 and we're MOVING in order to make YOUR experience a better one. Want more information about Champagne Living? Buy fixed price wine and enjoy Free Delivery Australia wide. Here's the spot for the BEST Free Stuff!